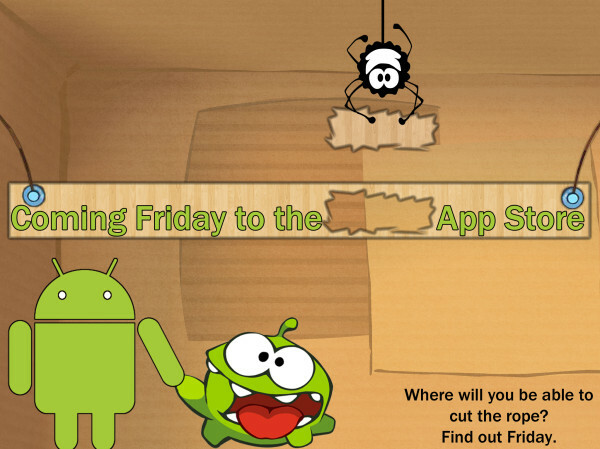 Cut The Rope Heading To Amazon Appstore This Friday? Cut the Rope is coming to the Android platform this Friday, and from the looks of it, we’re thinking it will be FREE on the Amazon Appstore. A few of the bigger titles have been released onto Android (Plants vs. Zombies for instance) with the price tag of free, so the number of downloads will skyrocket within the first few days. We certainly aren’t hearing any complaints about that business plan. Cut the Rope is one of the highest downloaded apps on the iTunes store for games, and there’s a reason why: it’s a solid game, with literally hours of entertainment to be had if you enjoy these cute/whimsical puzzle titles. Definitely be on the lookout Friday for this release.